The Juneau Reentry Coalition’s mission statement includes, “to promote public safety”. At JREC’s October 17, 2018 meeting we learned that is exactly what Alaska’s new Pretrial Enforcement Division (PED) is about. We support that. Leah Van Kirk, Southeast Pretrial Enforcement Supervisor, said that Pretrial Enforcement has three operational pillars: to maximize court appearances, to maximize community safety, and to maximize appropriate placement. The overall functions in accomplishing these pillars are pretrial assessments and initial appearance, supervision, and electronic monitoring. The pretrial assessment informs the court about the risk to the community of the accused in the likelihood of missing future court appearances and/or committing new crimes. The Judge will consider the assessment as a part of his or her decision on appropriate levels of supervision at the initial appearance of the accused. The Judge may determine if supervision should include Pretrial Enforcement Officer oversight, electronic monitoring, incarceration, or release on their own recognizance (OR). During the presentation, Ms. Van Kirk referenced research that indicates that the longer a low-risk person stays in jail awaiting trial, the greater their likelihood becomes for becoming a high-risk for committing new crimes. For example, a pretrial individual spending 2-3 days in jail is nearly 40% more likely to recidivate, 4-7 days in jail increases the likelihood to 50%, and for 8-14 days a person is 56% more likely to commit a crime. Reducing recidivism in Juneau is of keen interest to the Juneau Reentry Coalition. We support the work the Pretrial Enforcement Division is doing in keeping our community safe. 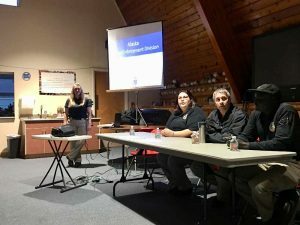 To find out more about JREC’s Pretrial Enforcement Division community meeting, you can read articles at the Juneau Empire and KINY’s News of the North sites. My name is William James Musser V, and I am in long-term recovery from substance use disorder. For me, this means that I have not used drugs or alcohol for an extended period of time, 33 months. To understand why I need recovery, you first need to understand my use. I started when I was 13 years old, probably for reasons like childhood trauma, trying to fit in, and it running in my family. As time went on, I moved onto harder and harder drugs and using more and more. I could never see it myself, but drugs were affecting my life a great deal. Subsequently I dropped out of school and got my G.E.D. and I became a felon, entering the revolving door of going to jail, getting out of jail, being put on probation, then using drugs and being put back in jail. This cycle would continue over and over again until eventually I finished my entire prison sentence and was fully released. However, I still continued to abuse drugs and alcohol. I began creating a successful career in caregiving, and working full time. I got hurt, and was one of the many who get prescribed painkillers. These ran out and I found that I could purchase OxyContin on the streets, which quickly took control of my life. Once they stopped becoming available I switched to heroin, eventually bringing me to my knees, and about to lose everything I had worked for. By some miracle, I sought out treatment at Lakeview Health in Jacksonville, Florida, saving my life. I went straight into sober living for six months and was taught all the different ways people were staying clean, like 12-steps, SMART Recovery, counseling, religion, community involvement, service work, sports, fitness, clubs, yoga, meditation, art classes, and much more. I’m so glad that I tried everything through that program because I got to see what tools worked for me, and was able to tailor them to my specific needs. For the most part I’ve stuck with these same tools, but I still like to switch it up from time to time to keep myself growing. For example, I’ve got to experience the services offered by recovery communities in three different states and bring some of that knowledge back to Juneau, which could greatly benefit from their example. Here our services have not quite caught up with much of the nation. It will take quite a bit of time to get similar programs running in our community, but I truly believe Juneau is on its way to providing up-to-date recovery options. We have so many amazing people who are both in recovery from substance use disorder and those who are just supporters trying to make this happen. Today I am in my 11th year as a caregiver for individuals with mental and physical disabilities. I’m switching careers to be a chemical dependency counselor and am currently a technician. I hold the following service positions: President of Southeast Alaska Fatherhood Alumni Association, Recovery Coach Certification from NCADD, Co-chair for Peer Support for the Juneau Reentry Coalition, 12-Step Area Service Position, and Board Member of Great Bear Recovery Collective. It takes a community coming together to take on a challenge this big. The push continues and I encourage everyone to get involved because at some point everyone will be affected by substance use disorder. There is a lot of stigma and I hope that people open their hearts and understand that many good people are suffering because of their use, making bad choices because drugs have hijacked their brains and bodies. If they can get clean and get the help they need, then they can be amazing members of this community. To those of you who are still struggling: I can relate to what you’re going through, and I made it out, for now. Substance use disorder will be something that we recover from for our entire lives. We will never be cured. But we can stop using the things that are destroying our lives and find a new way. Many people showed me the way and we can help show you. Don’t ever give up, there is always hope. Jim Musser’s My Turn was printed in the Juneau Empire on Sunday, September 9, 2018. Jim is Co-chair of the JREC Peer Support Workgroup. 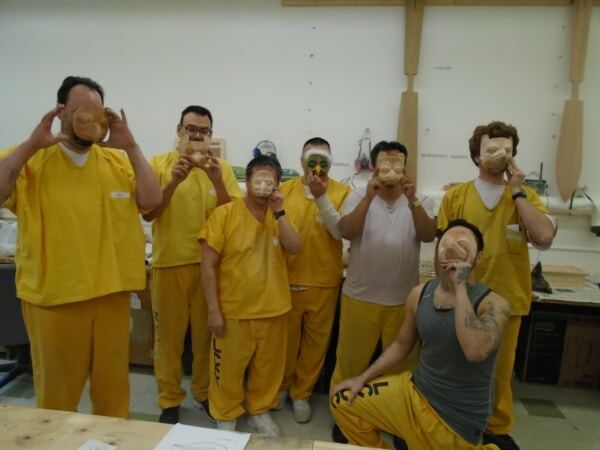 This winter the Alaska State Council on the Arts delivered professional artist business development training to artists incarcerated in the Juneau, Alaska Lemon Creek Correctional Center (LCCC). The four-day intensive training program marked the first time since our establishment in 1967 that we provided this service. The site-specific program, which served twenty-two participants, many of whom are serving long-term sentences, was developed and staffed in partnership with the Sealaska Heritage Institute and the LCCC Educational team. The program also served as a pilot to test its potential for delivery in additional incarceration facilities across the state. 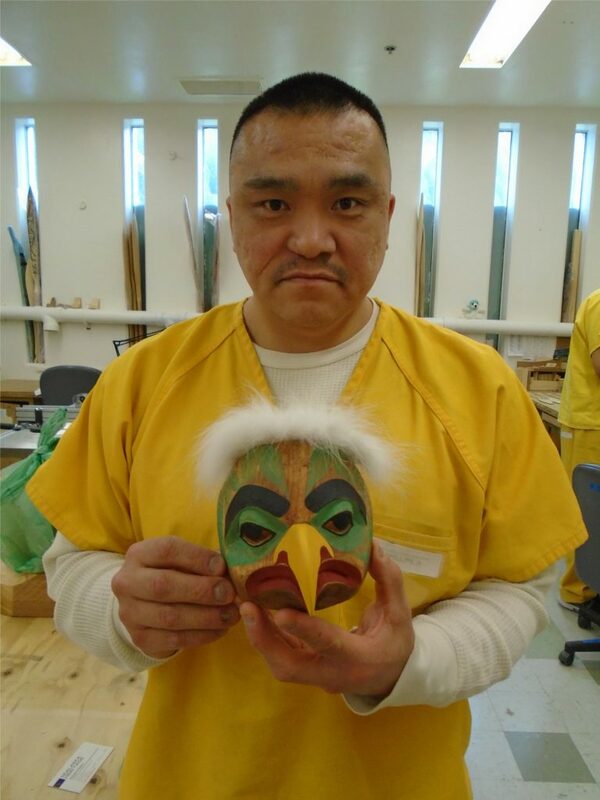 Lemon Creek Correctional Center artists showing off their carved Alaska Native masks. Two years ago ASCA completed a rigorous statewide strategic planning process where we clarified our mission and outlined specific goals and objectives for our agency as we strive toward the year 2020. The design and delivery of the LCCC incarcerated artist program targeted and accomplished three of our agency’s desired outcomes. First, we have started to, “develop strong communities by utilizing the arts to address social challenges and celebrate success.” Creativity is a learned behavior. As is destructiveness. The goal of our curriculum is to nurture the development of creativity and professional artist business skills for incarcerated artists. These tools may offer an antidote against internally and externally directed destructiveness and resulting recidivism after their release. One participant wrote in his evaluation, “When is the next class? Let me know, please. Thanks for everything you spoke about. You have been a great help and you really presented with confidence and compassion.” All of the participants asked for more resources, more training and set short and long-term creative and business goals. ASCA staff is scheduled to work on accomplishing these goals with the same group of artist inmates this coming August. Second we, “provided valuable resources and expertise to State of Alaska Departments and employees.” We were able to provide Paul McCarthy, Alaska Department of Corrections, Lemon Creek Correctional Center Education Coordinator and Assistant Superintendent, Daryl Webster with training resources, workbooks and a network of contacts to support their educational and business development efforts on behalf of incarcerated artists. We were able to share that our program teaches how the creative sector is grounded in professional business standards and ethical practices, legal contracts, and licensing. In kind, we learned a vast amount about Alaska’s correctional system and facilities requirements that will help us better tailor our pilot program and modify our curriculum to match their needs and meet their mission. We also discovered that a prisoner philanthropy program is already in practice at LCCC. Sealaska Inc. provides wood materials for free to incarcerated artists who make one piece to donate to nonprofit fundraisers and a second piece for themselves to sell. The program enables incarcerated artists to earn funds toward restitution and child support and act as meaningful contributors to their families and communities. 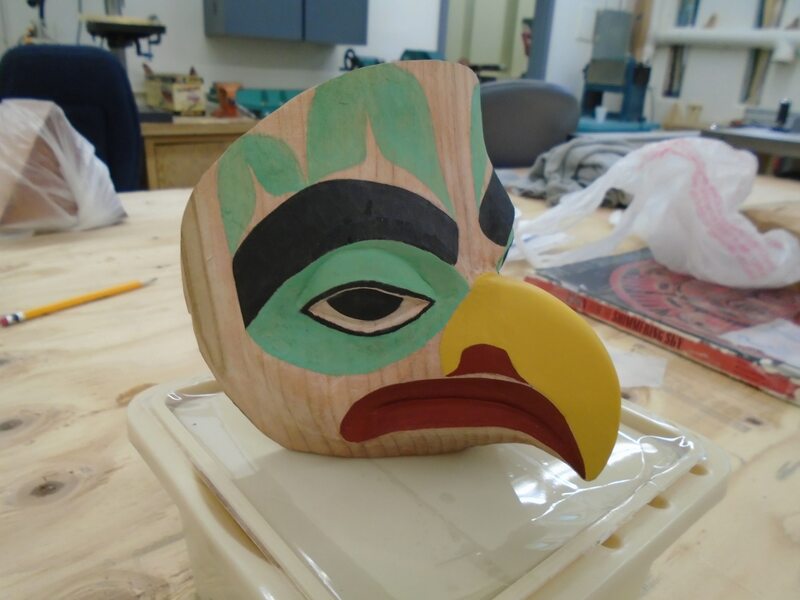 Alaska Native mask being created by Lemon Creek artist. models like Philanthropy Roundtable to learn how we might support these already existing efforts in Alaska’s correctional system. We are researching how we may support Alaska’s Community Foundations to serve as a liaison between incarcerated artists and the public. 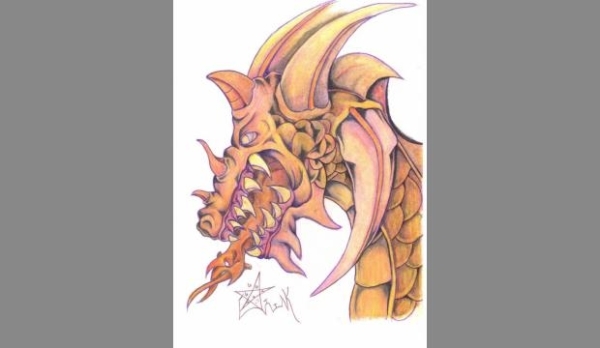 Incarcerated artists could contribute to a legacy endowment, managed by a community foundation, that funds community-directed health and wellness programs that support and protect individuals and families, including children of incarcerated parents, impacted by crime. Coalition and the work of the Alaska Native Justice Center. Our response about the value of this work is this. The time, training and relationship building embedded in this program are an investment in all Alaska individuals, families, and communities. This protective and proactive work nurtures individual’s creativity and arts business skills. Incarcerated individuals who are provided these resources are; less vulnerable to criminal recidivism after their release, able to access more expanded employment and earning opportunities to support themselves and their families, better able to maintain financial stability through earned income from their creative work, and empowered to express themselves constructively – rather than destructively – which helps to better maintain sobriety and mental and behavioral health and wellness. This work is about investment rather than expense – a pay it forward model – designed to support all Alaska artists, our families, communities and our state’s invaluable creative sector.